In the Apostles' Creed, we Christians confess that after dying on the cross, Jesus "descended into hell." This, of course, is the logical conclusion of Jesus' self-sacrifice. He was paying the full price for human sin, bearing in Himself the full punishment our sins deserve in spite of His complete sinlessness. This necessarily meant that after Jesus died, He had to go to hell. When people die naked in their sin, without the protective armor of God's grace given to all with faith in Christ, hell, separation from God, is their destination. Jesus warned of this when He told Nicodemus, "Those who believe in [Jesus] are not condemned; but those who do not believe in Him are condemned already, because they have not believed in the name of the only Son of God" (John 3:18). For Christ also suffered for sins once for all, the righteous for the unrighteous, in order to bring you to God. He was put to death in the flesh, but made alive in the spirit, 19in which also he went and made a proclamation to the spirits in prison, 20who in former times did not obey, when God waited patiently in the days of Noah, during the building of the ark, in which a few, that is, eight persons, were saved through water. We remember Maundy Thursday as the day on which Jesus, with His face set toward dying for us, instituted the Sacrament of His Body and Blood (Holy Communion, The Lord's Supper, The Eucharist) and gave a new command to His Church: that believers love one another as Christ loved us, sacrificially. We remember Good Friday as the day on which sinless God-enfleshed died in our places on the cross, so that all who believe in Him will find their sins covered by His life-giving blood and grace, His undeserved favor. We remember Easter Sunday, of course, as the day when Jesus rose from the dead, claiming eternal life with God for all who believe in (that is, entrust their lives to) Jesus Christ. We should also remember Holy Saturday, the day on which Jesus bore the full punishment our sins merit, descending into hell, but at the same time, proclaiming that God's plan had been fulfilled; the perfect sacrifice had been offered; the powers of the devil, evil, and hell had been crushed for all eternity. The devil, evil, and hell still wreak havoc in this world. They will until the day when Christ returns to fully establish His kingdom. But they are in their death throes. 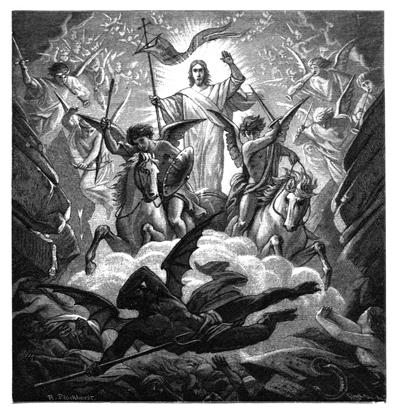 Christ has conquered! Snapped this picture of Saint John Roman Catholic Church here in Logan, Ohio, while taking a walk several nights ago. "What We Can Learn from a Thief"
Fantastic Good Friday thoughts from my colleague, Pastor Glen VanderKloot of Faith Lutheran Church in Springfield, Illinois, can be found here. Tonight at Saint Matthew Lutheran Church, 258 East Hunter Street in Logan, Ohio, we'll commemorate Good Friday, remembering the death of Jesus Christ on the cross some two thousand years ago. Jesus, the sinless God-in-the-flesh, took our rightful punishment for sin. As part of the service, which will begin at 7:00PM, we'll remember the seven last words, or phrases, that Jesus spoke from the cross. If you will be in southeastern Ohio, home to the beautiful Hocking Hills, we would love to welcome you. Also, if you're in the area on Sunday, you're invited to join us as we celebrate Christ's resurrection Easter Sunday--that's this Sunday, April 24. We'll have two Easter celebrations: at 8:00AM and 10:15AM. Why Do We Call This "Good" Friday? That's what an inquisitive second-grader asked me once. 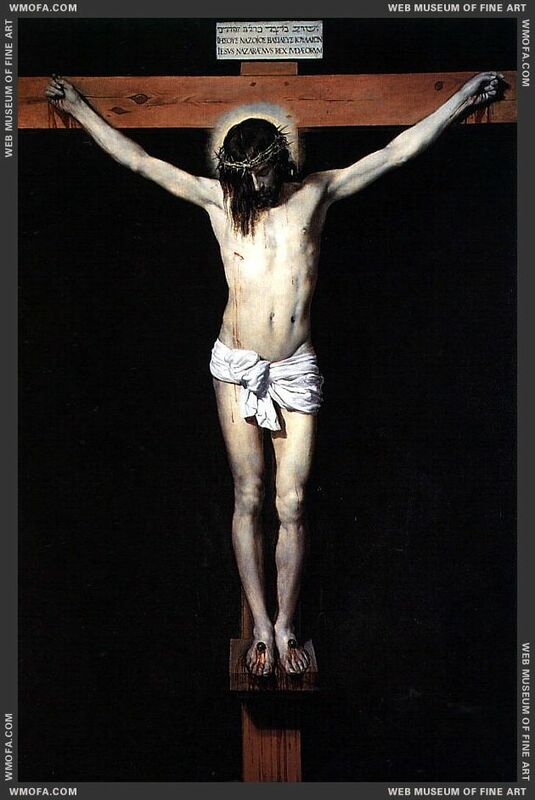 Good Friday, which this year falls on April 22, is when Christians all over the world remember the day when Jesus of Nazareth, the One we believe was the Messiah (that is, the Christ, God's Anointed King of kings) was crucified. This is the Maundy Thursday sermon of my colleague, Pastor Glen VanderKloot. It's helpful and inspiring. Karl Barth is considered one of the giants of Christian theology in the twentieth century. He was a world-renowned theologian in a time when the words of orthodox Christian theologians were covered by the mainstream media. That’s one of my favorite stories, because it gets at the essence of the Good News of Jesus Christ. While we were still sinners, the New Testament book of Romans says, Christ died for us. He did that because of His love for us. God knew that death was the rightful punishment for our sin. Yet, horrified by the notion that He might lose us all forever, God made an incredible decision. 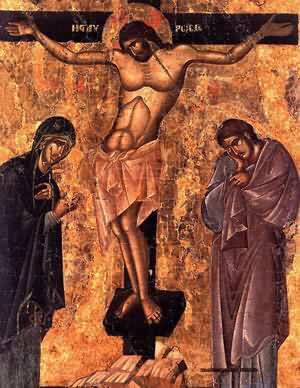 He decided to become one of us, lead a sinless life, and then make an offering of Himself on a cross. In Jesus Christ, God the Son, God became the Lamb of God, Who takes away the sin of the world. Anybody who will simply come to God, confessing their sin and receiving Jesus as their Lord, becomes a beneficiary of the love God gives through Jesus. “Jesus loves me” is absolutely true and the cross is proof of it. The Good News on which Christ’s Church is built is the tough, perseverant, eternal love of God! But Maundy Thursday stands as a reminder to us all. The love that we followers of Jesus talk about isn’t about God’s love for us alone. That's because on the Thursday before Jesus was murdered, He celebrated the ancient Jewish meal of Passover with His closest followers. There, He also instituted a new dinner. We call it Holy Communion, or the Lord’s Supper, or from a Greek word meaning "thanksgiving," we may call it the Eucharist. But Jesus did something else in that quiet room with the twelve: He gave them a mandate, a new command. Characteristic of Jesus though, He didn’t give that new commandment without first giving them a stunning illustration of it, an illustration that would have had particular vividness and power to the people of first century Judea, where Jesus lived. The Judeans of Jesus’ day regarded the foot as the filthiest portion of the human anatomy. That's still true of Semitic peoples, Jews or Arabs, to this day. Once, journalist Dan Rather went to Baghad to interview the one-time strongman of Iraq, Saddam Hussein. Rather apparently forgot himself, because during the interview, he crossed his legs, exposing the bottom of his shoe to Hussein. Hussein flew into a rage, left the room in an insult, and had to be coaxed back to finish the interview. Later, after US Marines entered Baghdad and helped Iraqis topple a statue of Hussein, the citizens of Baghdad showed their disrespect for Hussein by repeatedly hitting the statue with the bottoms of shoes. 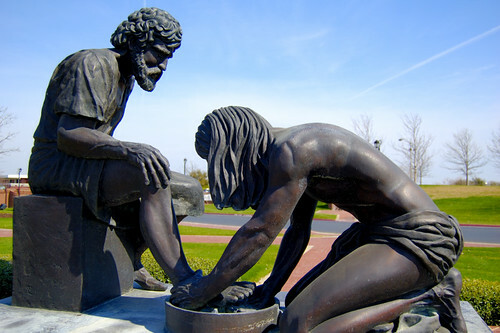 In first century Judea where Jesus lived, it was common whenever a guest had traveled dusty roads by foot for a slave to wash the feet of the traveler before dinner was served. But this odious task would only be done by a slave. It was considered beneath the dignity of anyone else. But as Jesus prepared to give His disciples the mandate to love as He loved them, He did something that no self-respecting lord or teacher would ever do. Jesus stripped off His only garment, wrapped a towel around His waist, and began to wash the disciples’ feet. Jesus’ Maundy Thursday mandate tells us that we dare not horde His love; it’s meant to be passed on. When I was a boy, I remember an assembly at our elementary school at which we welcomed a local TV show host named Mr. Perkins. At one point in the assembly, Mr. Perkins had a large group of us stand holding hands in a circle around the perimeter of the multipurpose room. One person in the front laid the palm of one hand against the surface of a large metal ball that was connected to a small, hand-cranked electric generator while holding the hand of another student, who held the hand of another, and so on. Mr. Perkins began cranking the generator and within seconds, everyone of us felt a small but noticeable jolt. He explained that each of us had acted as conductors of electricity. We felt it and so did the person we touched next to us. There are some people, stuck in a perpetual spiritual adolescence whose entire thinking about Christ and the Church is composed of the question, “What’s in it for me?” For people like that, Christian faith is nothing but a selfish pursuit of goose bumps and jolts. They engage in constant hopping from one experience or church to another because the “high” they got before wore off. But Jesus says that if we want to keep His love alive in our lives, we need to move from being mere consumers of His love and become reproducers of His love. For those grateful for the grace given in Christ, being a passive recipient of God’s love isn’t enough! We need to pass the grace on. We need to love the imperfect people with whom we go to church and the imperfect people in our world, just like Jesus loves imperfect people like us. Facing certain death, Jesus still served His imperfect, unworthy disciples. He could do that because the love the Father had for Him gave Him confidence to keep on loving in spite of His circumstances. Jesus wants us to live and love and serve with the same confidence! Soon, I was in my car heading for dinner with Ann and some friends. But I tell you, I felt so good! Jesus had made a connection of love with my neighbor through me! By taking the risk of passing Jesus’ love onto someone else, I could feel Jesus stoking the fires of my faith and making it grow. Anything else we may give away in life leaves us with less of it. Not so the love of Christ. The more you give, the more you have! In the few days before Easter, God may give you and me opportunities to make such connections. We can invite people who need Jesus in their lives to be with us for Easter worship. And in a few weeks, you’ll have new opportunities to serve our neighbors in Jesus’ Name when the Servanthood Team leads us in our PPSST! community food drive. You and I can say and sing with confidence that, “Jesus loves me!” And that’s an awesome and life-transforming thing. But when we show others through our loving, witnessing, serving, giving, and living that Jesus loves them, that’s when the God of Maundy Thursday, Good Friday, and Easter Sunday truly brings us to life! That's the title of today's piece at Our Daily Bread. Before reading it, be sure to first read the powerful passage of Scripture on which today's installment of 'Our Daily Bread' is based, 1 Samuel 11:27-12:23. It's one of the most powerful, poignant, and instructive passages in all the Bible. It underscores that God is both gracious and just: God forgives the sin of the repentant; but sin can still have consequences for the forgiven. When we genuinely pray for forgiveness of sin, we place ourselves under the authority of God, what some rightly call the sovereignty of God. Any time we repent for sin, we also implicitly place our lives in the hands of God. David accepted God's forgiveness...and God's sovereignty. God teach me to do no less. The people of Saint Matthew Lutheran Church, the congregation I serve as pastor, is reading the Bible together in a year's time. That's about three chapters each day. Once a week, groups of us get together to discuss the readings of the preceding seven days. Tonight, we discussed the first fifteen chapters of Numbers. I made several mistakes during the discussion--like not remembering the derivation of Hannukah and forgetting the exact calendar relationship between Passover and Easter. I drew a complete blank when it came to Hannukah. Here's the background. I also erroneously said that Greek Orthodox Christians don't accept the Apocrypha as being canonical. They do. I also said that I hadn't remembered that Moses had children. He did have two sons: Gershom and Eliezer (see Exodus 2:16-22 and Exodus 18:2-4). What bugs me is that I knew these facts and just plum forgot every one of them. Nonetheless, I hope you find this helpful. Curious About God's Will for Your Life? God will never impart advice through a friend or give you a feeling that is inconsistent with His character and will as revealed on the pages of the Bible. "Heaven, in the Bible, is not a future destiny but the other, hidden, dimension of our ordinary life--God's dimension, if you like. God mad heaven and earth; at the last he will remake both and join them together forever." N.T. Wright, Surprised by Hope: Rethinking Heaven, the Resurrection, and the Mission of the Church, 2008. Significant for Christians' upcoming celebrations of Maundy Thursday, Good Friday, and Easter--and significant for us at Saint Matthew, where as part of our reading of the Old Testament book of Numbers for Read the Bible in a Year--is that, on the Jewish calendar, Passover, the feast Jesus and the disciples celebrated when He instituted Holy Communion, began at sundown this evening. The Lord spoke to Moses in the wilderness of Sinai, in the first month of the second year after they had come out of the land of Egypt, saying: 2Let the Israelites keep the passover at its appointed time. 3On the fourteenth day of this month, at twilight, you shall keep it at its appointed time; according to all its statutes and all its regulations you shall keep it. 4So Moses told the Israelites that they should keep the passover. 5They kept the passover in the first month, on the fourteenth day of the month, at twilight, in the wilderness of Sinai. Just as the Lord had commanded Moses, so the Israelites did. Passover begins on the 14th day of Nisan. Nisan is the first month of the Jewish calendar. By the reckoning of this calendar, new days begin at sundown. Today is the 14th of Nisan, 5771. Passover, of course, remembers the events recorded in Exodus 12. There, we're told of what happened when God sent a tenth and final plague to Egypt designed to gain the freedom of His chosen people--the Hebrews or the Israelites--from slavery. They had been slaves in Egypt for 430 years. The tenth plague came when God sent the angel of death to bring the deaths of all the first-born in Egypt. The Israelites were spared though because, as God instructed them through Moses, they had previously smeared the blood of unblemished lambs on the doorposts of their dwellings. The lambs were offered to God in place of the firstborn Israelites. When the angel of death encountered the blood of the lambs, it passed over, ensuring that the first-born in those dwellings didn't die. Blood, of course, carries life. In the Bible's account of the first murder, when Cain killed his brother Abel, God said that the blood of Abel cried out. On the Day of Atonement, Yom Kippur on the Jewish calendar, in Temple times, an unblemished lamb was offered as sacrifice signaling repentance and bringing reconciliation (atonement) with God, on behalf of the people. Its blood covered the sins the people committed fin the preceding year. As part of the rite on this day, the priest sprinkled the blood of the sacrificed lamb on the people. The blood of the lamb, in effect, called out to God and God passed over their sins. The significance of this can be seen when we consider the statement of a devout Jew who came to follow Jesus as Messiah, Lord, and God, the apostle Paul writing in Romans 6:23, "The wages of sin is death." By God's gracious intervention, the ancient Israelites were spared the proper "wages" for sin; God allowed the unblemished lamb to take the place of His people. We Christians believe that just as the blood of unblemished lambs on the doorposts of the Hebrew dwellings in Egypt caused the angel of death to pass over God's people, leading ultimately to the Hebrews' liberation from slavery, the blood of Christ, covering the sins of repentant believers in Him, brings freedom from sin and death. Jesus is, as John the Baptizer put it, "the Lamb of God, Who takes away the sin of the world." And this sacrifice needn't be made repeatedly, as was true of the lambs of Yom Kippur. Jesus' sacrifice is effective once and for all. As the New Testament book of Hebrews puts it, Christ, the highest of priests, sacrificed Himself, so that all who repent and believe in Him are forgiven their sins, ever reconciled to God, and given everlasting life with God. A little mystery for your Monday here. Know that it will be solved by the time you finish reading. But first a note: It was windy, overcast afternoon yesterday when the videos that tell our story were taken. I took them with my cell phone and the wind sounds really loud. On Sunday, we decided to take a walk on a trail in one of the five areas that make up the Three Creeks Park. Operated jointly by the Columbus and Franklin County Metropolitan Park District (Metro Parks) and the Columbus Recreation and Parks Department, Three Creeks is, as described here, "a major hub in the Franklin County Greenways program, an interconnected system of trails along the seven major streams in Central Ohio." All told, Three Creeks contains 1067-acres of scenic beauty and varied species habitat where three creeks converge: Alum Creek, Big Walnut, and Blacklick. Two areas in the park system are like conventional city parks with softball diamonds, soccer fields, play areas, and the like. The other three, operated directly by the Metro Parks, have walking trails through some beautiful scenes. Last year, Ann and I walked through one area of the park, one affording gorgeous views of the creeks and surrounding wooded areas. But yesterday, with the sun on the wane as we headed back to Logan from visits with our families, we went to a relatively new and not-yet fully developed area called Heron Pond. It's sort of cool that this already interesting nature sanctuary sets astride busy roads so accessible and still is insulated by woods and grasses. Their flight patterns were like those of bats. They swooped down close to the surface of the water. At first, I thought they might be like a gull, but they never dipped into the water. If fish had been their prey--and the pond apparently is home to quite a few fish, they would have seemed poor hunters. At this close range, we also saw what appeared to be a bluish cast to the sides of the birds' heads. We were later told that this was merely a reflection of ultraviolet rays, similar to what you see with pigeons. Their crazy, bat-like flight patterns made Ann and me think that, like some other species of birds, these mystery birds weren't real accomplished fliers. But then we watched two of them take out over the lake, then swoop back toward us and we realized that they're versatile in their flight patterns. That's just how they roll. Even before we showed these videos to our ornithologically-informed friend, Jody, he had a good idea of who these white-bellied birds on Heron Pond were: tree swallows. The tree swallows swooped over the lake and marsh area because, like bats, they eat insects and just above the surface of the water, there's apparently a feast of gnats to be had. Unlike bats, which are mammals, of course, these birds aren't nocturnal hunters and they don't have built-in GPS systems. Somewhere along the line, God said, "OK, tree swallows you get the bugs during the day. Bats, you take the night shift." Thanks, Jody, for solving that mystery for us. Here is information on the tree swallow from the Audubon Society. 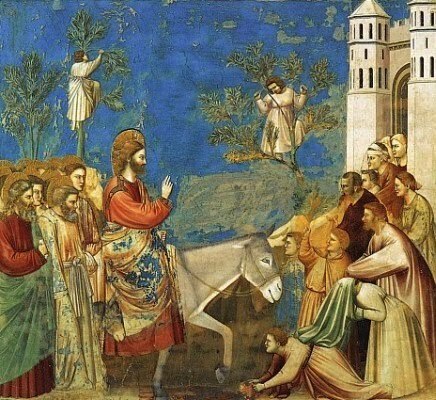 Today, as we celebrate Palm Sunday, I want to talk with you about humility. Both our Gospel lesson from Matthew and our second lesson, written by the apostle Paul to the Christian church in the Greek city of Philippi, underscore that Jesus accomplished His mission of saving all who believe in Him from sin and death through His humble submission to the will of God the Father. Prophetic fulfillment or not, it may have been at this moment of seeming triumph that some in the crowd began to suspect that Jesus hadn’t come to be the sort of king for whom they were looking. The people didn’t expect Jesus to be a humble Savior Who submitted to death on a cross as the ultimate and only atoning sacrifice for sin. They wanted Jesus to be a conquering king who fulfilled their expectations of Him, destroying their Roman conquerors, lining their pockets with money, and making their lives easy. You can imagine why, within a few days’ time, disappointed and angry that Jesus wasn’t the king they wanted Him to be, many in this same crowd who hailed Jesus as king would, by Thursday, call for His execution. They wanted Jesus to exhibit humility, alright: a humble submission to their wants and whims and not to God the Father Whose intention it was (and is) to offer us much more than ease in this world. He offers instead, an eternity of life with Him. And that eternity with God begins in this life, where God refashions us, sometimes in ways that bring us pain and humiliation, into the people God wills us to be, the people we were made to be. Jesus was humble before the Father and so not only fulfilled His mission of dying and rising for us, but also reclaimed His rightful place as King of all creation, as your King and my King. Just as Jesus, Who never knew sin, had to humbly submit to the will of the Father in order to claim new, everlasting life for all who believe in Him, we who are sinners must humbly submit to God so that our old sinful selves can be crucified day by day and God can give us the life Christ has won for us. That entails submission to Jesus Christ and His Word, the Bible, as the final authority over our lives. It also means confessing our sins and humbly seeking and accepting His forgiveness. Jesus’ plan for those who follow Him is that, with Him, we will rule over creation for all eternity. But that will only happen when we humble ourselves, surrendering to Christ and Christ alone. Then Jesus gives instructions on how they’re to prepare for their celebration of the Passover. The other day while preparing for this sermon, I noticed something in that first verse that I’d never seen before: The two disciples Jesus sent aren’t named. Think about that! These two disciples are sent on one of the most important missions in human history and Matthew doesn’t see fit to give us their names. They aren't given any credit. You already know why: Because who Jesus sent wasn’t important; Who sent them—Jesus—was everything. Paul once quoted a Greek poet who said that in God "we live and move and have our being.” Those who simply walk in the good actions God has prepared for them beforehand to be their way of life don’t need credit. All the credit and the glory go to God. Those who humbly trust in Christ have the simple and awesome privilege of living as God made human beings to live, imperfectly now and fully in eternity! “Have this mind you that was in Christ Jesus,” Paul writes. Be humble as your King is humble. The question which all this talk of humble submission to Christ lays before me anyway, is, “How humble am I willing to be for Christ?” How low am I willing to go in order to place myself completely under Jesus' Lordship? Two weeks ago, I recounted the true story of Pastor Jim Cymbala’s encounter with a homeless man after worship on an Easter Sunday and how Cymbala’s revulsion melted and he was able to share the Savior Jesus with this man who desperately wanted Him. As I told the church council this past Tuesday, "Be careful what you pray for." Within minutes of my offering that prayer, a member of this congregation told me about someone who needed to hear about Jesus. On the following Monday, I got a call from a member telling me about someone else who needed the same thing. I went to both of those people, in absolute awe of the ways in which God answers our humble prayers. Later that week, I was able to share the Good News of Jesus with the family and friends of that second person when I was asked to preside at her funeral. In the face of these answered prayers, all I could do was thank God and express my awe of His greatness and of His willingness to allow an imperfect sinner like me to play some small role in bringing Jesus to others. It was amazing! Be in awe of God. But, please, do not be impressed with me! You see, this past week, I fell off the humility wagon. Another phone call. Another person from outside of the congregation in need. But this time, like the priest and levite in Jesus’ parable of the Good Samaritan, I was preoccupied with my own agenda, bothered by this inconvenient interruption. I was curt with the person who made the request for help. “I can’t do everything,” I said. But, of course, God hadn’t asked me to do everything. He asked me to do just one thing…and that one thing was something I had actually asked Him to send my way! I remembered Jesus’ words in Matthew 5:23-24: “So when you are offering your gift at the altar, if you remember that your brother or sister has something against you, leave your gift there before the altar and go; first be reconciled to your brother or sister, and then come and offer your gift.“ I realized that I couldn’t offer my praise (or my requests) to God until I had done what I could to set things right with this person I had wronged. So, I rummaged through my trash (that's humbling) until I found the discarded paper on which was written the telephone number of the person with whom I felt I’d been so short. I called. There was no answer. But thankfully, there was an answering machine on the other end of the line. I mentioned who I was and apologized for my wrong. We can’t manufacture humility. We can’t resolve to be humble. Humility is a gift we may not always want, but which truly is a gift. God will give us humility only as we submit to Jesus Christ, asking the Father and the Holy Spirit to give us the same humble spirit that caused Jesus to willingly ride a donkey into Jerusalem, knowing full well what horrors lay ahead of Him in the next few days. As we prepare for Holy Week and Easter, pray that God will fill you with the humble spirit of Jesus. If you pray that prayer, there will be times, I suspect, when you too will fall off the humility wagon. But it is the humble, those who willingly lay their whole lives under the authority of the God made known in Jesus Christ, who experience oneness with God. They know the exhilaration of being part of God’s holy plans and work in the world. They have the privilege of seeing what happens as they fulfill the great commandment to love God and neighbor and the great commission to make disciples in their neighborhood and in the world.